Gulf Shores condo for sale at Sailboat Bay. Must see sunsets at this Sailboat Bay unit! Not only is this private gated community known for its deep-water location, it is also so close to the conveniences of Foley and the adventures of gulf shores! Sail boat bay is located on the southeast shore of Mobile Bay at the mouth of the Bon Secour river-on plash island. This sunset view unit is in the newest building, and has boasts about 1600 square feet on the top floor w/elevator & stairs available. Priced to sell! Living space & master bedroom both have access to the amazing view over the bay from your own large outdoor space! The open kitchen is perfectly designed for entertaining! 2 bedrooms & 2 baths are on the mail level, another loft bedroom space above, and there is loads of storage space & even finished attic space, too! Sold furnished w/appliances & furniture. Just add your preferred updates if you want or not because it is-move in ready!!! Community amenities: bay front olympic sized pool, indoor/outdoor pool, 3 acre park area, kiddie pool & hot tub, tennis court, fitness room, boat launch & more!!! 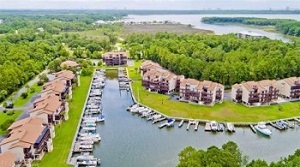 Direct access to mobile bay and the inter-coastal canal from the marina, where you have your own boat slip w/ lift! Bring your boat and get ready for amazing sunsets!! !